This tomato tart made its way around the food blogging sphere not too long ago and while I did not get the chance to make it I did bookmark it. Now that the locally grown field tomatoes are looking nice and ripe it was the perfect time to make it. This tart is made with layered phyllo dough though you could easily use puff pastry dough. 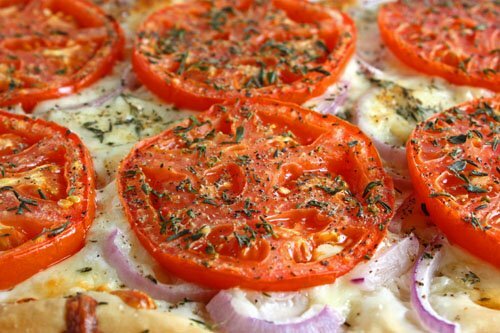 The tart is topped with some onions, mozzarella cheese and of course fresh tomatoes. Parmigiano reggiano is spread between the layers of phyllo dough for even more cheesy goodness. The tart is finished with a fresh herb and I went with some fresh thyme. I cut the size of the recipe down to half by folding or cutting the phyllo sheets in half. The phyllo tomato tarts were pretty easy to make. The phyllo dough came out nice and golden brown and crispy and buttery and good. The thinly sliced tomatoes on top roasted a bit concentrating their amazing flavour. The thyme added a really nice aroma to each bite of the tart. Lay a sheet of phyllo dough on the parchment paper and brush the top with butter. Sprinkle 1/2 tablespoon of the parmigiano reggiano on top. Repeat steps 2 and 3 with the rest of the phyllo dough. Spread the onions slices on top followed by the mozzarella. Place the sliced tomatoes on in a single layer. Sprinkle the thyme on top along with the salt and pepper. That tart looks stunning and delicious. I have a recipe GF phyllo dough I have been meaning to try. I think this will make it the perfect reason to do so. WOW! This tart look awesome! We are really going to have to make this some time and as tomatoes are in season maybe soon! Looks good. It would make a good entry for Ivy’s event. Love the close up picture! And I bet it’s super yummy too. Who doesn’t love anything with fresh tomatoes in it? Looks perfect! That tart looks packed with flavour! I wish I could slice tomatos as perfect as you. Kevin, I have just been going through all your posts that I’ve missed and again, I am totally in awe. Honestly, your blog is simply outstanding and the pictures are gorgeous. I wish I lived nearby to enjoy all the great things you make. Nice job with the tart. I love this time of year with the wonderful tomatoes out there. It looks like you got the most gorgeous tomato of the season. Lovely! mmm… bookmarking this for the weekend, along with something else i can’t remember from your site! GORGEOUS! I must have missed it the first time it went around! This looks so, so good Kevin! The colors in your tart are beautiful! This is kind of like an upscale pizza. Yum! You cook so many beautiful dishes!!! Do you ever repeat dishes? I haven’t seen a yucky meal yet, Kevin. You eat so well! You’ve done a great job with the Tomato Tart! It looks gorgeous! Oh my gosh, how flippin’ pretty does that look? You continue to amaze us all. But where is the woven background? That is very good looking tart! I can imagine how crunchy the phillo and at the same time you’ll feel the juice from the tomato running down your throat. DELICE! I usually see this with puff pastry but phyllo is also an excellent way to go! (Well, anything as long as the tomatoes are good!) This looks so light and delicious, Kevin! That last photo really did me in! I have some garden fresh tomatoes in my windowsill right now – and you just gave me the recipe to use them in! Gorgeous. Kevin, those tomatoes look beautiful! Great tart!! Tomato tart is so appealing and especially now when tomatoes are so good and out of the oven with the flavour more intensified – oh baby. Yum! I love how there’s cheese added between the layers. Wow the picture just explodes off the screen – Looks so great. I love making vegetable tarts and this one is looks delicious. ooo.. I can see that is perfect for spring! Love light meals or snacks like that! Oh my gosh that looks good, I am salivating just looking at it! That’s so Mediterranean!!! I love it!!!! This looks divine. I almost made a tomato tart yesterday, but now, NOW I’ll be making a tomato tart today! I can’t control myself any longer. I’m sorry, but all I can think about is having this for lunch right now!! This tart looks so simple and yet so scrumptious!!! Great looking tart! I love this time of the year when fresh tomatoes are available at the farmers markets. This is for sure going to be bookmarked for me to make. The tomatoes look amazing! Talk about a tart! It is gorgeous! Looks delicious and a great idea for using up all of the tomatoes that are coming into my garden right now. Thanks for sharing! thanks for the recipes – do you cook Asian food much? Kevin, 1st time I see this recipe. I love playing with filo. It would make a great appetizer. SteamyKitchen: There are just so many new things that I want to try that I do not often get the chance to make things over. Beautiful! And I always have phyllo in my freezer. What a great combination of cheeses, veggies and seasoning. Sounds and looks simply amazing. Snap! I love tomato tarts on phyllo dough. I made one a few months ago and I’ve been tossing around how to switch it up a bit. This looks great! A most magnificent tart Kevin! I haven’t seen it arround Kev, I think I would remember it if I have seen it in other blog. Man, does that look great or what?!!! This is SO pretty, Kevin! I just love any kind of tart, but tomato tarts are definitely one of the best. YUM. Oh, I like the look and sound of this. Good job, Kevin. PS…do send this along to Ivy’s event it would be perfect!!!! Gorgeous! I’ve been wanting to make a tomato tart, and this one sounds perfect. I love this idea, I think I’ll try it while the tomatoes are so nice and fresh! that looks like a really good tart! Oh wow – how have I missed this going round the blogs? Yours looks fantastic, and is it just me or is cheese between the layers of phyllo the ultimate decadence?! i love all the different ways you are using these fresh tomatoes! this is like a greek pizza using phyllo instead of pizza dough! delightful recipe. as i was reaching into the fridge i noticed my fresh batch of basil pesto, so i used that to baste the phllo…we gobbled it up.